A great gift idea for the home or office. Simple, easy-to-grow dish garden greens make this a worry-free plant to upkeep. With a little bit of water and some sunshine it'll last a long time. With 5 beautiful pink roses added to make it all that much more appealing, this is one gift sure to make an impression each time they see it. 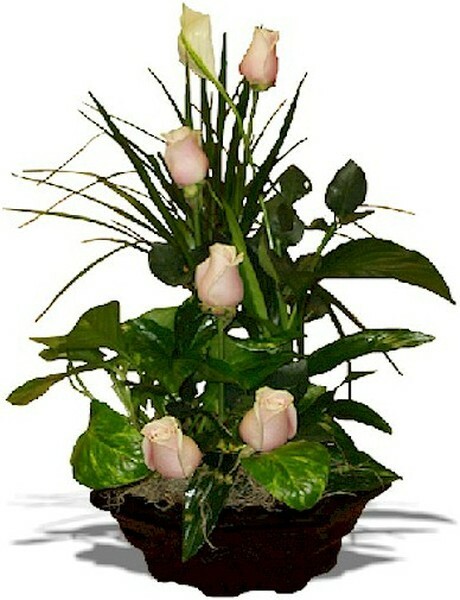 Roses are cut stem flowers in water tubes and will last only a few days, after which they should be removed. Green plants are live and should be taken care of to ensure long-lasting enjoyment. Roses available in red, pink, white and yellow colors. Indirect light, moderate water and temperature. Other sizes available.